The 808 drum machine has been the essential backbone of Hip Hop, RnB, and Dance style hits. If you want the sound of the most famous drum machine ever built, D16′s Nithonat is the perfect emulation for you. On ‘Drum Month’ promo at over 30% off right now. 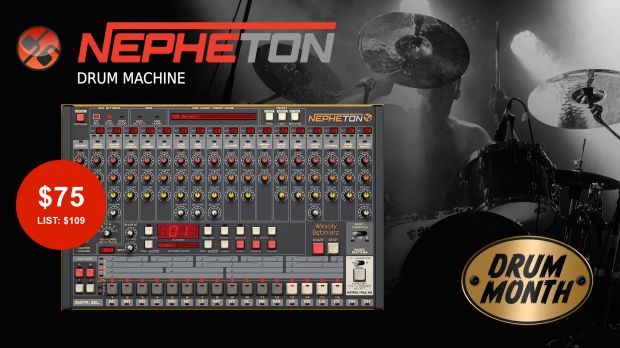 Nepheton contains 17 fully synthesized modules that work together to emulate the original 808 drum machine. All the sounds and detailed nuances of the original are captured perfectly. Nepheton’s modules are equipped with additional controls for deep tone and envelope tweakability. Listen to the audio examples or just download the demo and start beatmaking today! This entry was posted in DontCrack, Promotions, Virtual Instruments and tagged 808 Drum Machine, 808 drum machine Emulation, D16, Nepheton. Bookmark the permalink.